In 2009 at a Graduate Level Think Tank for the Global Leadership Program (GLP) at Macquarie University, the topic of ‘Sustainable Leadership’ was discussed by Harry Bergsteiner of Macquarie Graduate School of Management (MGSM). Bergsteiner has examined what characteristic traits successful companies have in common, the focus on what makes a good leader. In case studies of successful companies from around the world, similar patterns began to appear. The way in which company leaders operate business and, more importantly, how they treated their subordinates showed to be the biggest indicators of success. In reflecting on traits that make a successful leader, and thus a successful organization, if the same traits were applied to environmental management, would it see the same success? In 1991, Shelley Kirkpatrick outlined the ‘traits that matter’ in successful leaders: drive, desire to lead, being honest/having integrity, self-confidence, knowledge of the business, high-level of intelligence, and energy. Several characteristics are attributed with the first trait: motivation, ambition, energy, tenacity, and initiative are often found as key components of drive. However, as Kirkpatrick points out ‘traits alone are not sufficient for successful business leadership—they are only a precondition’. An individual’s ability to motivate others, set goals and having a detailed vision, is also necessary. Outlined throughout these characteristics runs the relationship leaders have with those who follow them. As managing the environment is often more about managing people than wildlife, management decisions made with regard to it are done largely on the basis of economics, business, and/or political gain, rather than what is best for the environment. An example is the management of global fisheries, where eighty percent of the worlds ocean community biomass had been exploited within fifteen years of industrializing fishing (Worm, 2003). Current management strategies aim to ‘stabilize fish biomass at low levels’ globally, including unexploited healthy seamounts where biomass remains high (Worm, 2003). This, despite evidence that catch sizes are decreasing worldwide and food scarcity is of major concern for countries such as Japan who heavily rely on fish as a prime food source (Clapham, 2007). The failure to manage resources sustainable can be seen as a lack of three key leadership traits in the approach of Environmental Management. Firstly, there has been a lack of knowledge with regard to the dynamic plasticity of the environment. Secondly, a lack of integrity and strength to withstand pressures from businesses that exploit the commons for their own gain and lastly, given the flexibility with which management plans need to have within them to accommodate the non-static environment, having a detailed vision may be necessary, but often difficult to achieve. In what has come to be used as the model for coastal zone management, Jens Sorensen’s 1997 paper outlines Integrated Coastal Management (ICM). Sorensen explains that ‘every coastal nation has at least five elements in common: (1) coastal systems, resources, and environments; (2) coastal issues; (3) institutional arrangements; (4) planning and management techniques; and (5) stakeholders’ (Sorensen, 1997). The essential theme identified for the successful adaptation of Integrated Coastal Management schemes is that every level of participation be present, from local communities to federal governments to international organizations. In many planning models, disincentives and incentives are recommended to motivate individuals into the ‘correct’ actions and behaviors (Sorensen, 1997). The problem with extrinsic motivators is they have been known to fail, especially if the motivator is monetary, as many developing countries and poor communities will succumb to bribery. Given that biodiversity loss often falls upon the poor (Holland, 2009), those living in communities of high poverty will be more likely to trade their environment for money. It has been outlined that traditional forms of reward no longer work in motivating people if the task requires engagement (Glucksberg, 1962). In what has become known as the candle experiment, Sam Glucksberg from New York University describes how incentive motivated tasks are surpassed by intrinsically motivated tasks time and again, especially if engagement is required from an individual. If, however, the activity is self explanatory, like redundant factory work, then incentives work as the typical management model expects, the individual does well. Essentially, if the ‘job’ is obvious, then incentives work. If the ‘job’ requires peripheral thinking, incentives don’t work. What has been shown to be effective is allowing individuals the incentive of autonomy to master the ‘job’. Successful cases of this can be seen in Wikipedia, the online encyclopedia where individuals contribute just because they ‘want’ to (Bruns, 2008). 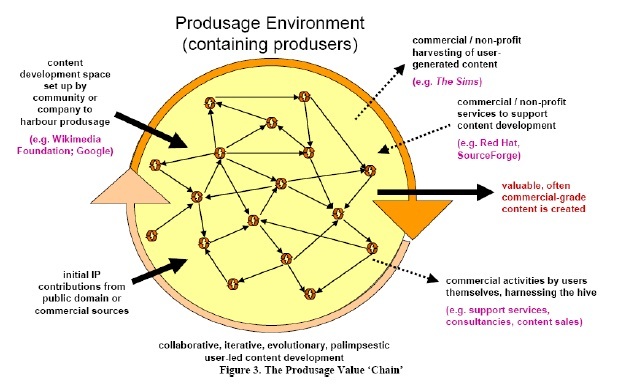 The World Wide Web has established new business models and created the next generation, dubbed Generation C, that exercises control over their content (Bruns, 2008). 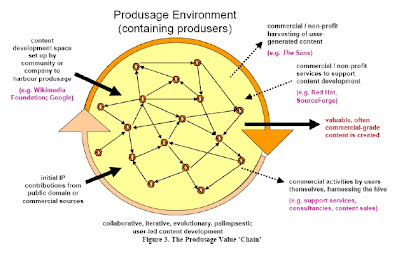 This new generation is responsible for the collapse of established media and other industrial models through content sharing and informed choices in consumption (Bruns, 2008). Moving from individuals and teams to collaborative communities demonstrates the shift away from old industrial memes. How businesses run in this new community paradigm will surely determine their future success. The importance of performance management in organizations is important now more than ever and leadership is considered a crucial trait with regard to increasing efficiency and productivity (Bolden, 2008). Leadership has traditionally been defined through the individual, however the emergence of a more effective collaborative engagement from all participants within an organization has been shown to be the most significant influence on success (Bolden, 2008). Corporations that have created a sense of social identity by giving attention to what is important and valued among and within the organization are working in the new community based paradigm. The complex study of the environment needs the full engagement from environmental planners, conservationists, scientists, policy makers, and society at large. The ideology that is plaguing current management models is deleterious to the success of effectively managing human’s behavior with regard to the environment. Mainstream management models fail, for they don’t have the flexibility to move and shape around ever changing technology, culture, or environmental ecosystems, thus the needs of the people are often overlooked. In order to develop effective environmental management, a wider community based approach needs to be part of the framework of any planning tool. Incentives given to local communities should be intrinsic ones that reflect the values of that particular town, customs, and environment. Long term education and involvement should be part of every management plan that will instill a sense of responsibility to conserve natural resources and develop a knowledge base for generations to come. In the search for better tools to environmental management, strong leadership is necessary, but not if it continues with the current obsolete management style. Social equality, sustainable development, environmental protection, and sustainable economic growth are measures of corporate social responsibility and have become the standard by which businesses determine impacts on society (McAdam, 2003). Moral and ethic obligations of corporations are at the heart of developments like ISO1400 and have helped steer management decisions that impact the environment in the right direction. Never the less, ‘there seems to be a mismatch between what science says and what business does’ (Pink, 2009) and ‘instead of sitting "idly by or [waiting] for fate to smile upon them," leaders need to "challenge the process” (Kirkpatrick, 1991).